The Japanese anime film Akira reflects a “love-hate attitude toward monsters” that suggests ambivalence about the future of Japan (Napier). This essay will explore this interpretation of the film, drawing on Japan’s rise as an industrial nation in the aftermath of the Hiroshima-Nagasaki bombings. It will examine Japan’s role as a global superpower, contrasting it with cultural feelings of victimisation, antagonism and fear at the hands of the West. These concepts will be juxtaposed against Tetsuo’s own monstrous transformation at the end of the film. The years leading up to the release of Akira marked one of the most rapid economic growth spurts and politically tranquil periods in Japanese history. Japan stood proud as the “only non-Western society to have successfully industrialised every aspect of its economy” (Napier). Moreover, with its “superb bureaucracy”, “efficiently functioning government”, and “high technological expertise”, the nation symbolised a “utopian alternative to what many perceived as the corrupt and decadent societies of the West” (Napier). So when Akira was set upon Japanese audiences in 1988, with its post-apocalyptic dystopian views of “carnage, inner-turmoil [and] extreme violence”, it questioned what was beneath the surface of this seemingly blissful society (Napier). The film opens with a bold heading: “1988.7.16.Tokyo”. It is obvious to audiences that what they are viewing is a modern day utopian Japan. What follows is a massive atomic blast that destroys the seemingly peaceful city. This, to a Western viewer, may seem like just the premise of an action movie, but to Japanese audiences, the fact that Japan is the only country in the world to suffer an atomic attack; the “point of view flows more to a sense of victimisation” (Wynn). This introduction into the world of Akira emphasises the situation of Japanese culture, as does the “student revolution” sub-plot in the first half of the film. It depicts a dystopian society, dominated by mass hysteria and devoid of any parental authority. This fictional setting is actual commenting on the “increasingly competitive nature of [Japanese] society, which appears only to emphasise material values and appears spiritually sterile”, as well as “the erosion [of] the cities” and of “a sense of community” (Napier). This cultural disintegration “confuses the children to the point of alienation and isolation”, which is shown through the character Tetsuo (Wynn). In the place called Neo-Tokyo, where “revolutionists wage war and street gangs run wild”, the character Tetsuo is introduced (Wynn). He is not the leader of the gang, but the runt. His best friend Kaneda runs a gang of bikers, determined on beating their rivals through force and unflinching violence. As the black sheep of the group, Tetsuo’s character development is a significant reflection of Japan’s perceived place in the world. The motorcycles they operate as a gang can be seen as “phallic symbol[s] of power and authority”, and it becomes obvious that there will be a struggle between Tetsuo and Kaneda for power (Napier). The motorcycle may also symbolise “isolation and alienation” which are Tetsuo’s chief characteristics. 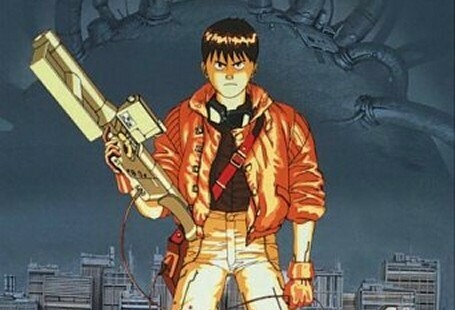 If Tetsuo represents the isolated and hesitant Japan, then perhaps Kaneda represents the confident, controlling America. The relationship between the two is initially positive, but underlying tensions and feelings of resentment gradually emerge, until the climax of the film, when the two forces are in bitter opposition. (Grace). Tetsuo’s initially meek character transforms and changes radically throughout the film, to the point where he resembles an almost Cthullu-like abomination by the final act. When Akira was released in 1988, Japan was at “the peak of post-war… rise from the ashes” and “many feared it as being the world’s next super-power” (Grace). Similarly, Tetsuo begins as a relatively minor part, but grows into the central, most powerful role in the narrative. It offers both hope to the downtrodden, the social outcasts of society, but also warns of how a sense of victimisation can become an all-consuming and destructive force, both to the perceived victim and the people around them. This is illustrated when the mutated Tetsuo crushes his girlfriend Kaori. Once again, this fear of self-destruction reveals a significant characteristic about Japanese society at the height of its post-war/post-atomic rise to power (Grace). The bond between Tetsuo and Japanese society is strongest through the subject of “metamorphosis”. The character undergoes a clear development and degradation, embodied by a physical transformation and psychological breakdown. This “shifting nature of identity in a constantly changing society” has been an issue for the people of Japan for many years (Napier “Akira” 55). Torn between many beliefs and an ever evolving culture, Japan has had difficulty forming its own identity. It is an Asian nation that has adopted Western religious beliefs and a Western economy. Everything from technology to fashion passes through its culture at rapid succession. Mass audiences (or pop culture) are constantly changing, and constantly seeking new things (Shamoon). This struggle is shown in the development of Tetsuo, first mentally and then physically. At first, “Tetsuo rejects his powers in favor of what he knows” (Wynn). This is shown by the scene in which he goes back to take Kaneda’s bike. This also shows that although Tetsuo has grown in power, he still lacks control over himself. This implies that Japan, although it is gaining strength, “is still just waiting to fall apart from the inside out” and is “a country still trying, in an age of technology, to grasp hold of its own history” (Shamoon). Symbols of Japan’s past litter Akira, such as the Ronin—warriors who existed outside of the government and law—“much like the biker gangs of Neo Tokyo” (Shamoon). Akira suggests that “identity [both national and personal] is in constant fluctuation”, and can be read as postmodern text (Napier). At the climax of the film Tetsuo transforms into a grotesque combination of man and machine. He is helpless to stop his own growth and screams for help from Kaneda. In this moment Tetsuo realises that, although he has become strong, authority still lies back with his leader Kaneda (Napier). This scene illustrates Japan’s own hesitation as a self-realised superpower, drawing on its feud with America over World War II and the Hiroshima-Nagasaki bombings. Something with too much power can cause destruction that will be felt for generations to come. The American nuclear bombing of Japan didn’t just kill hundreds of thousands of civilians, but left a radioactive cloud of poison in the region for decades to come, causing countless mutations and deeply scaring the Japanese psyche. Likewise, the God-like entity known as Akira was responsible for the destruction of Tokyo and the beginning of World War III. The Japanese were able to bury Akira deep beneath Neo Tokyo, but never fully eradicate him. His subterranean presence was a constant memento to the city of a self-realised apocalypse. Like the Hiroshima-Nagasaki bombings, Akira could be contained, but never wholly forgotten… or forgiven. The Japanese social consciousness picks up on this and knows that “with growth in economy comes mass power”. Although it is “ever forming new faces”, Japanese culture still shows these “traits of advancement with great caution” (Shamoon). While, the film presents some interesting allegories for modern Japan’s struggle for self-control, Akira remains a decidedly nihilistic text. Akira’s central images are of characters roaming the streets aimlessly on motorbikes (machines which themselves are a symbol of alienation). This seems to represent the futility of the quest for self-knowledge (Shapiro). The film also examines a society with no sense of history or parental guidance. All of the characters are orphans in some form, and maintain a strong distrust and revolt towards adult authority. The landscapes depicted are “ruinous”, with old Tokyo “represented only by a dark crater” (Grace). If Otomo is commenting on the cultural state of Japan, then his conclusion is not optimistic. Akira can also be read as an attack on the Japanese establishment, in which several aspects of Japanese culture are satirised, in particular “schooling and the rush for new technology” (Grace). In American animated features “mass culture articulates social conflicts, contemporary fears, and utopian hopes and attempts at ideological containment and reassurance”. (Napier). This illustrates how, in Western animation, audiences experience stories that are well rounded, happy in their conclusion and leave the central characters in a better world than when they started. On the other hand, Japanese animation “resists any attempt at ideological containment, and could well be a cinema of de-assurance, rather than reassurance” (Napier). This shows how anime, as a whole, is open to the hero falling, or of an open-ended conclusion, that doesn’t tie up all of the loose strands. This narrative style reflects the societies themselves. While “America [would deny] any fault in their society and hesitate to point this out directly on animated film”, Japanese animation “embraces [it] and makes [it] the battleground for most of their film’s questions” (Grace). In Akira, the lone anti-hero Tetsuo is isolated and alone, much like a lone nation, struggling against all the odds. In 1997, the stock market collapsed in Japan. It was the biggest financial downturn since the Great Depression. Society in Japan cracked under the strain, eating away at its banking funds, and the growing super-power that was Japan started to crumble from the inside out (Shamoon). So, it could be said that Akira, in attempting to show what would happen if a country become too powerful to govern itself, actually predicted the Japanese economic crash. In other words, the unstoppable force Otomo was addressing in the late 80s is different to the modern Japanese landscape. Akira is really a “direct outgrowth of war and postwar experiences” (Wynn). Otomo grounded the work in recent Japanese history and culture, using the atomic bombing of Japan during World War II, alongside the economic resurgence as inspirations and underlying issues. Thematically the work centers on the nature of youth to rebel and the transformative passage of adolescence. This is represented by the morphing experienced by characters. The film has prompted “both film and social historians to regard [it] as a unique source of insight into national cultures” (Napier). Tetsuo’s journey represents a struggling nation, changing identity all the time and never slowing down. The monster Tetsuo becomes by the end of the film was Japan’s ultimate fear. They had once desired an all-consuming, empirical power, but were shocked by the atrocities they committed and retaliation that was delivered to them, in pursuit of this power. Akira is about Japan’s ambivalence towards itself, towards its own history, and the monstrosities it is capable of. Akira reminds its audience that those who study evil are studied by evil.